The characteristics of pagoda marquee rental are easily defined by their impressive high peaked roof design. The pagoda marquee rental is available in sizes from 3m –10m and combines traditional tent design with high – tech innovation, creating an architecturally pleasing, yet fully functional, structure system. Because of their high versatility, pagodas marquee rental are an ideal choice for a wide array of event applications. 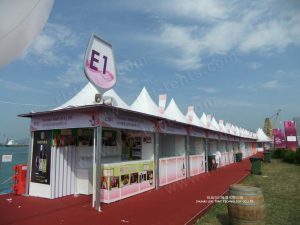 From entrance canopies through to wedding receptions or eye-catching exhibition halls, this range of structures will impress whatever the event. 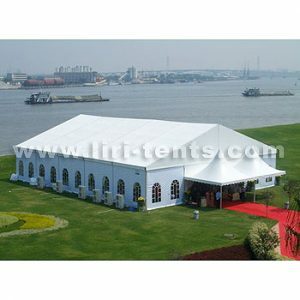 Liri Tent is the first one aluminum tent manufacturer in China, with 18 years experience, mature design and technology, persistent high quality and after sale service!? We have exported to over 96 countries all over the world and won great reputation. And we have adopted strict European safety standard to prduce our tents and according to ISO 9001:2008 managerment system. And advanced processing machines have been used to ensure the high quality of our tents.